Whipple Point was named for U.S. Army Lt. Amiel Whipple. In 1853 Lt. Whipple was surveying for a railroad route along the 35th parallel (1 mile South of here) for military and pioneer use. He passed down the broad, sandy wash below this overlook in December of 1853. Impressed with the deposits of petrified wood along the banks of the wash, Whipple named it Lithodendron Creek (Lithodendron is Greek for Stone Tree Creek.) Look down here and you will see petrified wood. 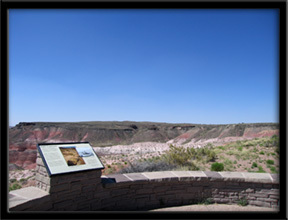 This entry was posted in National Parks, Petrified Forest and tagged Arizona, Painted Desert, Petrified Forest National Park, petrified wood, scenic overlooks, Whipple Point. Bookmark the permalink. Whipple Point looks similar to Nizhoni Point!